Kids, especially young ones, always seem to have this thirst for knowledge when it comes to animals and here's an opportunity to fill that thirst and give them what they want. The We Discover Wildlife: Forest Quest app can be used on your iPod touch, iPad, and iPhone as a way to learn about forest animals in a fun and engaging way. The app has been set up to feel like a game and kids can either put their knowledge to the test against the computer or play with up to four players. Instead of giving kids a mindless game to play, this education app is filled with all kinds of wonderful information about a variety of forest animals. The We Discover Wildlife actually features more than 350 questions and the answers regarding the animals that live in the forest. This is a brand-new release and has been created for kids ages four and older and even the adults will enjoy this one. What a great way to spend family night together having fun playing the game while learning all kinds of interesting information. The game requires iOS 6.0 or later to play and because it's a new release it doesn't yet have any updates. This one doesn't contain in-app purchases, third party ads, and does not share personal information. Users have given this one a perfect five star rating calling it great and excellent. There’s no better way for kids to learn then through an engaging game that offers challenges and reasons to come back again. The We Discover Wildlife can be played on their own against the computer or they can play with between two to four players. There are three different difficulty levels here and you can actually create each player's profile and set their level. There are presents to earn, bonuses to win, and you will have to complete tasks as you go. The game uses pop-up visuals so that the animals seem to jump off the screen and come to life. Because there are so many questions to work through there is literally hours' worth of gameplay here and it also feels different each time you play. As for the game controls expect kid-friendly, smooth operation at all times, without any confusing menus to navigate through. 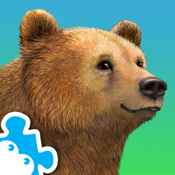 The We Discover Wildlife app for your iPod touch, iPad, and iPhone is an engaging experience filled with beautiful graphics, smooth game controls, and plenty of learning opportunities.